Prostate cancer is the second most frequently diagnosed cancer in men after lung cancer and the fifth most common cancer worldwide. Prostate cancer frequently metastasizes and contributes significantly to the morbidity associated with advanced disease. Chronic lymphocytic leukemia (CLL), is a B-cell neoplastic disorder characterized by a progressive accumulation of functionally incompetent CD19+, CD20+, CD5+, CD23+ and CD10− clonal lymphocytes. In the vast majority of patients, the disease mainly involves bone marrow, peripheral blood, lymph nodes and spleen. Extramedullary and extranodal involvement is rarely seen at diagnosis in these patients. We report two cases of metastatic adenocarcinoma of prostate in our previously diagnosed and treated chronic lymphocytic leukaemia patients at NIBD. A 40 years-old, married male was diagnosed Chronic Lymphocytic Leukaemia in 2012 and had received 06 cycles of FCR (Fludarabine, Cyclophosphamide, and Rituximab regimen every 28day and infectious disease prophylaxis). On his follow up visit he had complains of radiating pain from right scapula to lower limbs. On examination his vitals were normal and on physical examination non-tender testicular swelling was noted. 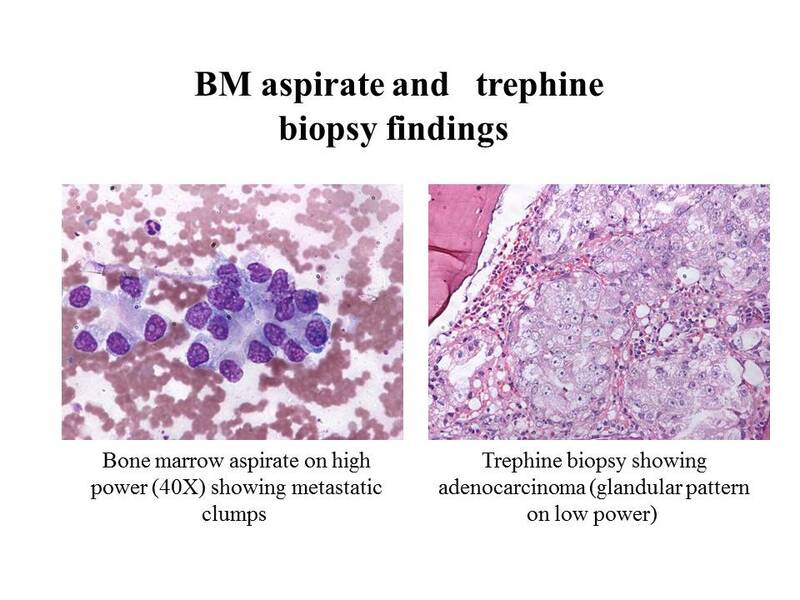 Bone Marrow D/R and Trephine was done to see status of primary disease and concluded prostrates adenocarcinoma. The bone marrow was almost completely replaced by a metastatic carcinoma forming cohesive sheets of cells with focal glandular differentiation. Immunohistochemical markers were applied, which were as follow CD45: Negative, PSA: Dim Positive, PSAP: strong Positive and OCT4: Negative (which excluded out Seminoma and Embroynic cell carcinoma). A 67 years old, male known case of Chronic Lymphocytic Leukaemia diagnosed in 2009 and had received 03 cycles of Chlorambuci. Presented with progressive weakness, SOB and backache with MRI findings showing multiple vertebral collapse. Same findings were found on bone marrow biopsy and results of immunohstochemical markers were as follows CD45: Negative, PSA: Negative, PSAP: Focal Positive and OCT4: Negative. Surgical opinion confirmed the diagnosis. Several recent surveys have pointed out that CLL patients are at high risk of developing a large variety of second malignant neoplasms but only few cases of prostrate adenocarcinoma are reported.